We’re not going to waste your time here with fluff or a drawn out sales routine. Instead, we’re going to get straight to the heart of what the Therapy Marketing Institute can do for you! If we didn’t continue to receive comments like those above from our members as well as see the results with our own eyes, we wouldn’t believe this was true. Simply put, we know exactly how you feel. 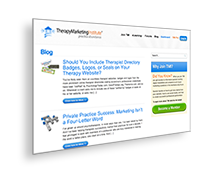 The Therapy Marketing Institute is unlike any other therapist marketing or training provider online. So trying to compare TMI membership to something else you’ve seen or used is really difficult to do, if not impossible. 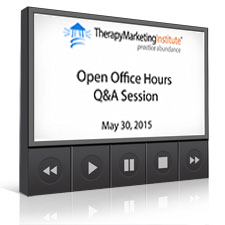 The Therapy Marketing Institute is a new generation of Internet marketing for therapists. Think of it as Therapist Marketing 2.0 … Or, maybe even 3.0! How frustrated do you get spending hundreds, if not thousands, of dollars and countless hours creating a website, writing content, submitting profiles to online directories, networking, giving presentations, and so on, and so on… only to find yourself wondering why you’re not getting more clients? You know how important and valuable the work you do is for your clients. And we’re betting you feel tremendously fortunate to be able to help people create the best relationships and live the best lives they possibly can. The work you do is incredibly rewarding… But it’s not easy! What you may not have realized was how challenging it would be to grow your practice to the point where you could focus your time and energy on the things that are most meaningful to you… Spending time with your family, doing the work you love (seeing clients), and having time to play. You know you need to invest some time and effort into your business that doesn’t involve seeing clients. And you know marketing is important. But how do you go about growing your practice in a way that’s cost and time effective? And how do you market your services in a way that feels truly AUTHENTIC? in a Way That’s Truly Authentic! Let’s be honest with ourselves… the more you do the same things everyone else is doing, the less of a chance you have of producing above-average results. Hundreds of therapists are creating new websites, submitting their profiles to online therapy directories, and paying the search engines for advertising space every single day, flooding the market with information and services similar to yours. Don’t get us wrong. These things work. But for all the time and money we put into these systems, the results are often barely worth the effort. The problem is not that you’re doing the wrong things. Trust us, this is NOT your fault. Many of my clients have struggled with these issues. Heck, even my mother and I have struggled with many of these issues. As a licensed marriage and family therapist who’s spent the past couple of decades building one of the most profitable private practices in the country, Bea knows what you’re going through. She’s been there herself. But, for well over a decade now, she’s consistently booked 30+ full-fee clients per week, often with a waiting list, and all without accepting insurance! As for myself, over the past decade I’ve founded several online businesses and invested over a hundred thousand dollars and over ten thousand hours helping mental health professionals across the country create thriving private practices. I’ve created websites, built e-mail lists, and published online newsletters. I’ve used search engine optimization, pay-per-click advertising, and social media. Some of these marketing campaigns worked, and some of them didn’t. Have you tried mailing postcards to let everyone you know know about your private practice? Created a website? Attended some networking functions? Have you taken workshops here and there and listened to the so-called “experts” talk about how you should market your practice? Have you listened to your colleagues on the same subject, and thought that, while they each have some good ideas, there must be some easier, more organized way to go about this – without having to get an MBA? I’ll bet some of the things you’ve tried have led to some successes… at least for a time. Thankfully, you DON’T need to go through all of this trial and error in order to be successful. … It Can Even Be Fun! If you’re at all like me, you’d probably be quite content knowing you can make a good living by helping other people, while also feeling confident you can stand on your own two feet and provide for your loved ones. It’s also likely that you intuitively know your training as a therapist and your private practice are ideal means to do just that. What you may not realize is that, outside of the work you do with clients, HOW you market your business is the single most important determinant of your success. Now I know a lot of professionals – therapists included – feel uncomfortable with the idea of having to “sell themselves” when their businesses are all about helping others. But marketing is about MUCH MORE than simple advertising or sales. Marketing is the life’s blood of your business. Think about it for a second… Other than providing valuable services and doing great work, what’s more important than marketing? Accounting? Finance? Insurance? Legal representation? All of these may help you keep the money you make, but none of them will help you grow your business, make more money, and reach and help more people. Marketing is about letting the people who need the services you provide know that you’re available to help. You’d be doing a DISSERVICE by not letting the people who need your services know you can help them create healthier relationships and a more fulfilling life! Successful marketing doesn’t require you to present yourself as something you’re not. In fact, doing so is detrimental to the long-term health of your business. Effective marketing is not about having a website, it’s not about search engine optimization, it’s not about giving speeches, advertising, or sales. You don’t even need to use the Internet to grow a successful practice! Does using the Internet make it easier to grow your practice? You bet! But, ONLY if you understand the fundamentals of successful marketing. And only if you know how to use them efficiently and effectively. You see, one of the core principles you need to understand is that successfully marketing and growing your practice is all about knowing yourself. It’s about building on your strengths, understanding and working within your limitations, and staying true to your passions. Perhaps above all else, successful marketing is about building relationships… Building relationships with referral sources as well as with current and prospective clients. In a nutshell, marketing is the process of UNDERSTANDING the wants and needs of your clients and referral sources and COMMUNICATING with them in order to help them achieve THEIR GOALS. Once you understand that successful marketing is all about being yourself and building win-win relationships with others, the possibilities for making marketing fun become more apparent. You know your prospective clients’ wants, needs, desires, fears, and frustrations better than almost any other business owners. You’re passionate about the work you do. And creating healthy, healing RELATIONSHIPS is the foundation of the services you provide. So, why aren’t more therapists more successful when it comes to marketing their practices? In my opinion, it’s simply a lack of education and understanding. Over the past decade, I’ve helped hundreds of counselors, psychotherapists, clinical social workers, and other health and wellness professionals create thriving practices by building a team to help my clients create effective websites, get first page search engine rankings, run pay-per-click ad campaigns, and write powerful marketing copy that converts prospects into paying clients. Helping mental health and wellness practitioners like you create the professional and private practice success they desire has become something of a quest of mine. And I’m betting you’re a lot like many of the clients I help every day. Now, I’m not telling you any of this to brag. 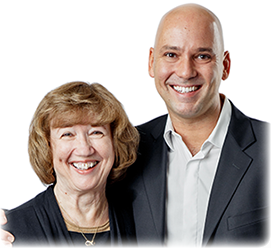 I say it so that you know we don’t just teach this stuff at the Therapy Marketing Institute… My mother and I actually do this stuff every day. And along the way, we’ve perfected a large number of strategies and tactics. More importantly, like any good scientist, I’ve documented each strategy and used them to create step-by-step tutorials, courses, and trainings for my team, so our best ideas could be repeated and rolled out to benefit all of our clients. Thankfully, these tactics and strategies – as well as the underlying principles you need to successfully grow your practice – can be learned by ANYONE. And many of them apply regardless of whether you’re marketing your services online or off. You don’t need to become a marketing maven to succeed. You DON’T need to know and do it ALL to build a successful practice. Well on Your Way to Achieving the Practice You Desire. 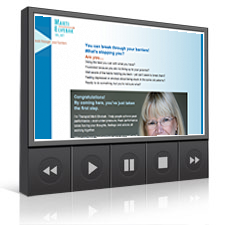 Just to be clear, the strategies, tactics, and training materials inside the Therapy Marketing Institute don’t contain ANY fluff. These are the fundamental principles, procedures, blueprints, checklists, and techniques we use every day to help our clients and our businesses succeed. In other words, they’re all about getting done what needs to get done. If you want theory or backstory, go read a blog post. 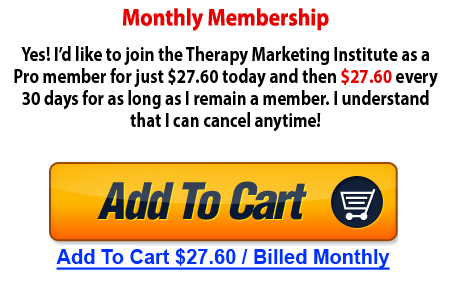 How to create additional streams of income that allow you to help even more people without being stuck in your office. In the past, these strategies, formulas, blueprints, and checklists were our advantage alone. 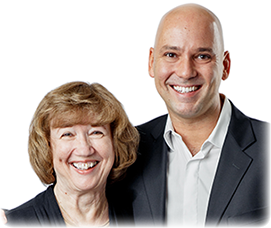 But with the launch of the Therapy Marketing Institute, we’ve decided to open our businesses and make our cherished resources available to clinicians just like you! And, best of all, we add new tactics, techniques, and trainings to the TMI library each and every month. Seriously. 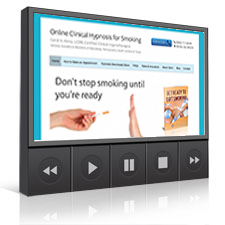 Every month we’re adding new training materials to our library. What can I say… we’re constantly trying new strategies and techniques… And we figure out a lot of cool, new stuff. But that’s not all. We’re continually going back and updating our training materials any time we figure out a new or better way to do something. And our trainings get updated a lot. Let’s face it. Change is the only constant in today’s marketing landscape. So we treat our training materials like living documents. We’re constantly innovating and updating our training materials since everything is housed in our online library and can be updated on the fly. Nothing gets old and nothing goes out of date. And, if for some reason we don’t have an article, blueprint, checklist, or training on a topic you’re interested in, just let us know and we’ll put it on the testing docket and get it added as soon as possible. So, why have we decided to share all this with you? Well for me, because not only is it my desire to see all therapists create the success for themselves they help so many others create, but because I was raised by a therapist. I was a teenager when my mother decided to return to school after a successful career as a journalist and get her master’s degree in clinical psychology. And, because I’m an only child and she was a single mother at the time, I often felt like I was going through grad school with her. I helped a professional association of therapists with its fundraising events when I was a teenager and went on to serve them as an administrator while launching my Internet marketing businesses. I started working with and helping therapists in my teens, and I’ve been helping mental health professionals from across the country ever since. I’ve helped therapists develop award-winning websites… I’ve helped therapists write powerful website copy that consistently converts prospects into full-fee-for-service clients… And I’ve helped them use advanced Internet marketing techniques such as search engine optimization to drive an increasing number of clients to their practice doors. I’ve spent the past decade researching and studying with every marketing guru I could find. I’ve spent months, even years, steeped in social media marketing, direct mail marketing, offline advertising, blogging, article marketing, video production, podcasting, and on, and on. Given this, it’s easy for me to understand why one of the major hurdles many therapists face when it comes to marketing their practices is the feeling of being completely overwhelmed by all of the things they BELIEVE they need to do to be successful. Well, you don’t need to recreate the marketing wheel, because we’ve developed all of the step-by-step articles, videos, and training materials you need to build a successful private practice. But, more than this… The strategies and tactics that make success possible are simply tools. And as tools, they can only be used effectively if you understand the PRINCIPLES that underlie their use. That’s why we not only want to give you the step-by-step tools you need to successfully grow your practice, we also want you to know and understand the fundamental principles you need to succeed. And these tools and principles can be successfully employed by ANY therapist, regardless of whether you’re marketing a book, workshops, online trainings, or your private practice, and regardless of the economic environment. I’ve helped countless therapists over the past decade and many of my clients continue to enjoy thriving and expanding practices, even during the course of the past few years. Regardless of the Overall Economy. I’ve helped therapists do just this on countless occasions. You see, my mother and I have consulted with hundreds of mental health professionals over the years and have seen the vast majority of them hit similar walls while trying to grow their practices. Most therapists were never taught a thing about marketing or running a business in graduate school. And while many therapists have hired us to help with individual aspects of their marketing endeavors, all too many seem to lack the holistic view necessary to successfully market a business. Educating individual therapists has long been a part of the work I do, but it has almost always been on a one-to-one basis. For one thing, I knew what a tremendous undertaking it would be. I also know that many mental health professionals are apprehensive about anything to do with marketing or sales. And I’m more than aware of how easily we can get caught in our own tunnel-vision from time to time. I knew that if I was to create such a program, I wanted to do so with a partner who understood therapists and who therapists would feel understood them. And I found the best partner imaginable… MY MOTHER! Like you, she struggled to effectively market and grow her practice when she first got started. But she has since gone on to build one of the TOP mental health practices in the country. In fact, many therapists now turn to her for advice and help with growing their practices. Like me, she has always wanted to help more therapists create the abundant practices and professional lives they desire. But her thriving practice has kept her so busy she has had little time to help more than a few colleagues here and there. So, we decided to combine our knowledge and experience helping mental health professionals grow their businesses, as well as our unique perspectives and senses of humor, to create a truly unique training and mentoring experience to help as many mental health providers as possible. Today you have an opportunity to join the Therapy Marketing Institute as a Pro member and get IMMEDIATE ACCESS to our ENTIRE library of articles, training videos, blueprints, checklists, and special reports, plus benefit from two unique perspectives: that of a highly successful therapist, as well as that of a self-made Internet marketer who’s been working closely with therapists for close to two decades. But this isn’t all you’ll gain when you become a Pro member of the Therapy Marketing Institute. 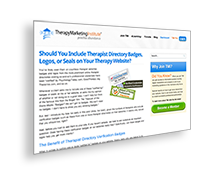 You see, when you join the Therapy Marketing Institute, you’ll also get access to our online, members-only forum. Because we never want a TMI member to have a question go unanswered, you can ask any question you have on any topic at any time in the TMI Forum and have my mother and I, as well as other members, help out. Can you imagine having the expertise of a psychotherapist with one of the top practices in the country, an accomplished Internet marketer who’s been helping mental health professionals for close to two decades, and tens, even hundreds, of other therapists at your fingertips? You can ask us anything. Advice on your website, marketing strategy, shopping cart platforms, e-mail newsletters, which traffic sources work best, brand and naming advice … literally ANYTHING! We can even help you with testing your marketing, search engine optimization, and point you to the contractors and vendors we use to get all the “geek work” done. There is practically no question that we haven’t answered and no challenge that’s too big. In other words, as a member of the Therapy Marketing Institute, if you have a marketing-related question and you don’t get an answer it will only be because you didn’t ask. And ongoing support and mentoring with people who’ve already applied that knowledge successfully. We’ve also learned that we all have roadblocks or difficulties following through that require support, accountability, and sometimes a little extra assistance. That’s why we’ve structured TMI so that all of our members have access to the support, feedback, guidance, and accountability needed so you can make consistent progress toward your practice goals. This ongoing support and personal attention is one of the unique features of the Therapy Marketing Institute. It can greatly increase the application of what you’re learning. And focusing on implementation is one of the key strengths of our program. We know you’re busy. But we also know that consistently working ON your business while working in it is the only thing that will create the results you desire. Our online question and discussion forum – in addition to all of our Action Plans, video trainings, special reports, and weekly Q&A and support calls – help us make sure you stay on track by providing the SUPPORT YOU NEED to stay focused on achieving your goals. Best of all, your mentors and coaches are an extremely successful psychotherapist and Internet marketer, as well as business owners. We fully understand what you’re dealing with, because we’re in the same trenches every day. Remember, by joining the Therapy Marketing Institute at the Pro level, you’re not only getting INSTANT ACCESS to our members-only forum and our ENTIRE existing library of Action Plans, articles, video training courses, blueprints, checklists, and special reports… You’re also getting access to ALL of our future trainings, and special reports. In fact, as a TMI Pro member, you’ll have access to every piece of content, every training, we ever produce, for as long as you’re a member! By becoming a Pro member of the Therapy Marketing Institute, your investment today is just $27.60 … That’s LESS THAN $1.00 A DAY. A paltry sum, if you ask me … especially when compared to what other programs cost or what you’re probably already spending (or will soon spend) on just one poorly equipped employee, contractor, or questionable service provider. If you’re a solo practitioner, doing all the heavy lifting on your own, just consider what your time is worth. Click here to access an entire library of strategies, tactics, and training courses to help you grow your practice. Allow yourself to imagine how good it will feel to finally TAKE ACTION. And I’m not even talking about the financial benefits you’ll reap … I’m talking about how you will feel when you’re finally DONE. The sense of completion. Now there’s a feeling we don’t get very often, is it? And unlike all the other times, you’ll actually have the confidence to do something because you’re following tested and proven, step-by-step formulas. More importantly, you’ll have the confidence to hand these strategies off to someone else … knowing the work is going to get done right the first time. Listen, as good as it feels to cross things off your to-do list because you completed them, it feels even better to cross things off your to-do list because SOMEONE ELSE completed them. We’ll show you how! There isn’t much more I can say at this point. 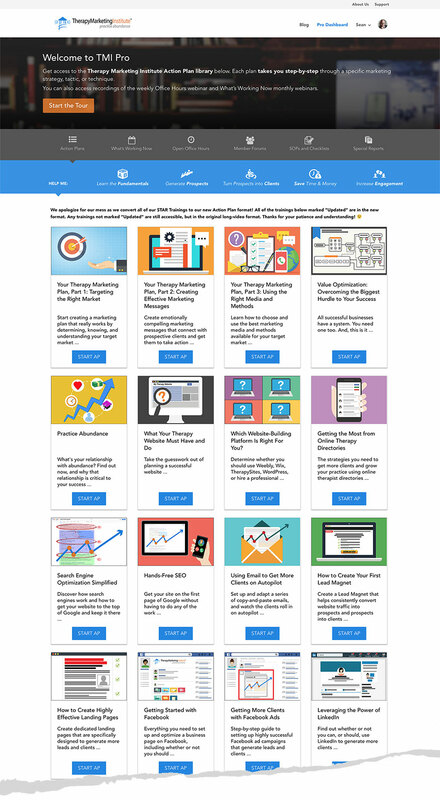 All of our Action Plan trainings, such as “Getting the Most from Online Therapy Directories,” “Search Engine Optimization Simplified,” and “Google AdWords Made Easy” (we currently have over 25 of these information-packed, step-by-step trainings on specific strategies and tactics designed to get you more clients today). Plus our Weekly LIVE Q&A calls, including live website, Google AdWords, PsychologyToday.com, Facebook, and Google Analytics reviews. Our members-only TMI Forums, where you can have all your questions answered at any time, as well as connect and help your fellow members (given we charge $200 per hour for consultations, this member benefit is PRICELESS). Breaking news and other updates delivered right to your inbox as they occur. But, all of the courses, all of the books, all of the information, and all of the advice and support in the world isn’t worth one thin dime unless you TAKE ACTION. And, if you need another reason to ACT NOW, know that we’re limiting memberships in the Therapy Marketing Institute to the FIRST 500 therapists who sign up. Frankly, we want to make sure all of our members get the attention they need and deserve. So, once we have 500 members, we’ll be closing the doors… And we can’t say for sure if or when we’ll open them again. 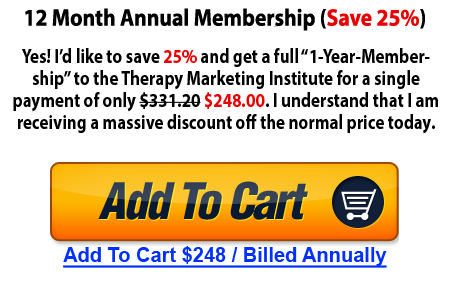 At only $27.60 per month and with a 30-day, risk-free, money-back guarantee, you literally have NOTHING TO LOSE … Except, of course, the possibility of losing out on the chance to create the abundant practice and lifestyle you desire if you don’t take advantage of this opportunity. So, click one of the buttons below and let’s GET STARTED … We’ll see you inside!